:The statistics are sobering: between 80 and 90 percent of kids who have grown up in the church are leaving the church after age eighteen. Children slipping away into a culture that tells them the Bible isn't true, sin is no big deal, God isn't real, or there are many ways to get into heaven. Whether parents may blame themselves or the culture, the result is the same: lost souls. But our God specializes in lost souls and the gospel is as powerful as it ever was. With wisdom that comes from personal experience, Jim Putman and his father, Bill Putman, offer brokenhearted parents and loved ones hope for their prodigals. A prodigal son himself, Jim has also found himself in the role of the prodigal's father when his own son rejected the faith. This family's powerful story of restoration, along with solid biblical truths and practical advice, will inspire, motivate, and equip readers to go after their lost sheep with acts of love and service. 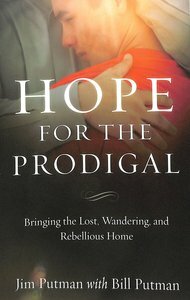 About "Hope For the Prodigal: Bringing the Lost, Wandering and Rebellious Home"
Bill Putman has served in ministry for more than fifty years as a pastor, a church planter, or an executive. He currently serves at Real Life Ministries as a servant leader over Team One and as part of the Legacy Team ministry. He and his wife, Bobbi, have five grown children, including Jim, and twelve grandchildren. They live in Post Falls, Idaho.